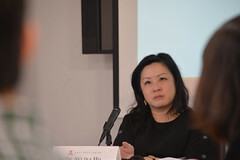 The conference program on the theme of “Bridging Diverse Cultures towards an Inclusive Asia Pacific Community” featured close to 100 presenters involved in substantive panels and expert discussions on a range of key regional topics, as well as a special luncheon honoring EWC/EWCA’s 2016 distinguished alumni and outstanding chapters and volunteers. 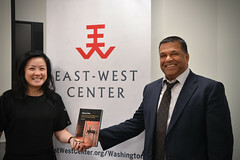 “The East-West Center’s devotion to strengthening the links that bind the two sides of the vast Pacific has enabled thousands of academics, policymakers, analysts, and public servants to share ideas and best practices, to learn more from their counterparts within the region, and to find opportunities to forge and take advantage of synergies towards the benefit of so many,” Philippines President Benigno S. Aquino III said in a keynote address to the conference participants. In addition to paper presentations and discussion panels, attendees participated in several cultural workshops featuring traditional Philippine dances and musical instruments. Participants also enjoyed a welcoming cultural performance, and put on their own traditional talent show during the closing Aloha Banquet. 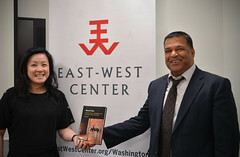 The conference was hosted by East-West Center, East-West Center Association and the EWCA Philippines Chapter. Click to see a full list of sponsors. We are already starting to plan for the 2018 conference and expect to announce the location later this year. Hope to see you there! This entry was posted in 2016 Conference, Alumni, Awards to EWCA Alumni, Conference, East-West Center, EWCA Philippines Chapter, Manila and tagged 2016 International Conference, 2016 Manila Conference, Alumni, Conference, EWC Distinguished Alumni Award, EWCA, EWCA 21st Century Outstanding Service Award, EWCA Outstanding Chapter Award, EWCA Outstanding Volunteer Award, EWCA Philippines Chapter. Bookmark the permalink.